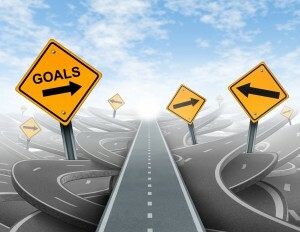 Are Your Goals … Important or Impotent? It’s a new year and everyone is thinking about their new goals. Health clubs are jam-packed with the New Year’s resolutionists who are starting off another year with the expectation that this will be the year they drop the extra 15 lbs. they have been carrying around the last few years. It’s a fact … health club membership’s jump up 65% in the month of January each and every year. One way of seeing this phenomenon is to make judgments that people are lazy when it comes to weight control and exercise, but I’m not so sure you can generalize with such a broad brush in this situation. Besides, projection and judgments we have of other people say more about you than the other person. I believe there is a lot of truth in that statement and I think it is a major cause why folks don’t always achieve their goals. So how does one identify goals that truly inspire them? One thought … your goals need to be aligned with values, priorities, and what is important to you at this point in your life. The thing to remember here is that priorities change, people change, and with that change you have to be sure you align your goals appropriately. We all have that friend who has had the same New Year’s resolution for the last 10 years and yet they never ever seem to achieve it. Sometimes you make life changing decisions, meaningful decisions that alter the course of your life and your priorities change. The older I get the more I realize that goals which fired me up me a few years ago don’t necessarily inspire me today. Doing sprint triathlons was great 4 years ago … at this point in my life what inspires me even more is having a conversation with our 16-year-old about eye contact and interviews and then hearing how the store manager complimented him for his eye contact during an interview yesterday. What inspires me today in my personal life is much different then what inspired me even a year ago. And while my desire to achieve financial success in my business is important, it wouldn’t matter at all if I didn’t have the opportunity to make a difference in the lives of my clients. Significance always trumps success in the long run! So the next time you start beating yourself up for not achieving your goals. Stop, look, and ask yourself, if your goals are in alignment with what you value most in your life today. PreviousPrevious post:Listen … Do You Want To Know a Secret?NextNext post:Celebrate Your Goals?